(Nanowerk News) Organic light emitting diodes (OLEDs), which are made from carbon-containing materials, have the potential to revolutionize future display technologies, making low-power displays so thin they'll wrap or fold around other structures, for instance. Conventional LCD displays must be backlit by either fluorescent light bulbs or conventional LEDs whereas OLEDs don't require back lighting. An even greater technological breakthrough will be OLED-based laser diodes, and researchers have long dreamed of building organic lasers, but they have been hindered by the organic materials' tendency to operate inefficiently at the high currents required for lasing. 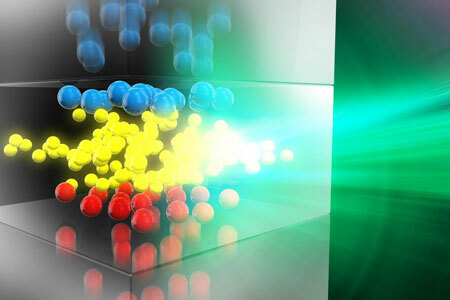 Now a new study from a team of researchers in California and Japan shows that OLEDs made with finely patterned structures can produce bright, low-power light sources, a key step toward making organic lasers. The results are reported in a paper appearing this week on the cover of the journal Applied Physics Letters ("Suppression of roll-off characteristics of organic light-emitting diodes by narrowing current injection/transport area to 50 nm"). The key finding, the researchers say, is to confine charge transport and recombination to nanoscale areas, which extends electroluminescent efficiency roll off the current density at which the efficiency of the OLEDs dramatically decreases -- by almost two orders of magnitude. The new device structures do this by suppressing heating and preventing charge recombination. "An important effect of suppressing roll-off is an increase in the efficiency of devices at high brightness," said Chihaya Adachi of Kyushu University, who is a co-author of the paper. "This results in lower power to obtain the same brightness." "For years scientists working in organic semiconductors have dreamed of making electrically-driven organic lasers," said Thuc-Quyen Nguyen of the University of California, Santa Barbara, another co-author. "Lasers operate in extreme conditions with electric currents that are significantly higher than those used in common displays and lighting. At these high currents, energy loss processes become stronger and make lasing difficult. "We see this work, which reduces some loss processes, as one step on the road toward realizing organic lasers," Nguyen added. OLEDs operate through the interaction of electrons and holes. "As a simple visualization," Adachi said, "one can think of an organic semiconductor as a subway train with someone sitting in every seat. The seats represent molecules and the people represent energetic particles, i.e., electrons. When people board the train from one end, they have extra energy and want to go to the relaxed state of sitting. As people board, some of the seated people rise and exit the train at the other end leaving empty seats, or 'holes,' for the standing people to fill. When a standing person sits, the person goes to a relaxed state and releases energy. In the case of OLEDs, the person releases the energy as light." Production of OLED-based lasers requires current densities of thousands of amperes per square centimeter (kA/cm2), but until now, current densities have been limited by heating. "At high current densities, brightness is limited by annihilation processes," Adachi said. "Think of large numbers of people on the train colliding into each other and losing energy in ways other than by sitting and releasing light." In previous work, Adachi and colleagues showed OLED performance at current densities over 1 kA/cm2 but without the necessary efficiency required for lasers and bright lighting. In their current paper, they show that the efficiency problem can be solved by using electron-beam lithography to produce finely-patterned OLED structures. The small device area supports charge density injection of 2.8 kA/cm2 while maintaining 100 times higher luminescent efficiency than previously observed. "In our device structure, we have effectively confined the entrance and exit to the middle of the train. People diffuse to the two less crowded ends of the train and reduce collisions and annihilation."